Atlanta and Pretty Southern have a tight relationship. Most of our writers and photographers are based out of ATL therefore most of our stories are centered around this fine city. So we decided to create the Atlanta Bucket List of things we’re yet to do together. There’s a lot of ground we have to cover from fine homes to helicopter pads. Pretty Southern readers will explore with us as we scope out key Atlanta historical sites, wonderful restaurants, and crazy culture. Here’s what we’ve got for Part 1 of our Atlanta Bucket List. Check back tomorrow for Part 2! Margaret Mitchell’s House. This is a big year for Atlanta’s most famous female author. We’re celebrating the 75th anniversary of “Gone With the Wind” and all its greatness. Paying homage to Miss Mitchell is a must. Zoo Atlanta. The city’s menagerie is home to thousands of different types of flora and fauna. We’re going to see it soon just to get a glimpse of this cute baby giraffe. Oakland Cemetery more than 70,000 souls have been laid to rest in this Southern soil, including our heroine Margaret Mitchell herself. But this place is so much more than a graveyard. Atlantans can enjoy the beautiful landscape filled with majestic oaks, dogwoods and flowers. Here where the dead lie exists a strange juxtaposition of life teeming with picnics, bike rides, kids playing and evening walks. Wren’s Nest home to Joel Chandler Harris who authored the tales of Uncle Remus, Brer Rabbit, the Tar Baby and other classic Southern fables. Mr. Harris worked at the Atlanta Constitution as an associate editor and he was a good friend of Mark Twain. The home just south of Atlanta’s bustling downtown is now a museum where Lain Shakespeare (great grandson of the writer) serves as executive director. 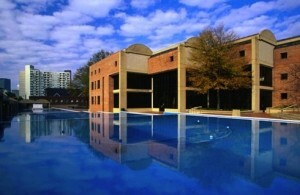 The King Center is the memorial site dedicated to Dr. Martin Luther King, Jr. Founded by his widow Coretta Scott King, this center is all about fostering social change without the use of violence. In our modern times of government upheaval it is essential to remember the amazing testimony of Dr. King. Wrecking Bar Brewpub recently opened in Little Five Points and is quickly making a name for itself in Atlanta’s foodie scene. Housed in a 100-year-old stylish Victorian home which has served as a residence, church, dance hall and now a brewery/restaurant. Wrecking bar offers tours every Saturday from 2 to 4 p.m. and will be participating in Atlanta Beer Week from Oct. 8 – 16. Is there something missing on Pretty Southern’s Atlanta Bucket List? Please post your comments below. We’ll have Part 2 posted tomorrow!